As you may remember, a while back Nvidia started designing and selling its own devices, after having been left practically without customers for its mobile chipsets. Hence, the company's Shield Tablet (since renamed and relaunched as Shield Tablet K1) served as a kind of showcase for the Tegra K1 chipset. However, Nvidia has already announced the newer Tegra X1 SoC early this year, and a new tablet bearing this particular chip was at one point tipped to arrive in March. That obviously didn't happen. Moreover, seven additional months have passed and this successor to the Shield Tablet is nowhere to be seen. That said, it might actually become official soon. That's because a prototype has been put through the paces of GFXBench, which means a list of most of its specs is now available. 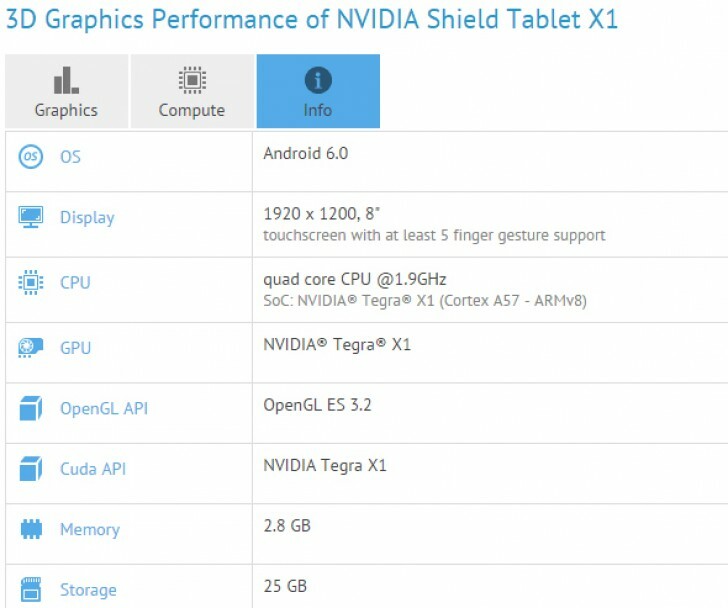 It will be called Nvidia Shield Tablet X1, which makes sense given the chipset employed. And yes, the Tegra X1 SoC has been confirmed by the benchmark. GFXBench for some reason only counted the four Cortex-A57 cores in the CPU, but this should be an octa-core part with four additional Cortex-A53 cores. The custom-developed GPU is apparently going to be twice as good compared to the one seen in the Tegra K1, and it will be capable of 1 teraflop of floating point performance. The Shield Tablet X1 seems to keep its predecessor's 8-inch 1,920x1,200 touchscreen, yet it comes with 3GB of RAM and 32GB of storage. It will have Bluetooth, Wi-Fi, and GPS too and will run Android 6.0 Marshmallow.